I like tools that make my life easier, and as a finish carpenter you wouldn't think a portable band saw would be one of these tools, but on rare occasion they really are. You might be surprised by the amount of metal I have to work with on any give job. For instance I might have to cut down a 1/4" think angle-iron L-bracket that it too long, or cut down a support post, or more commonly, cut metal closet rod to length. When reviewing the Stout-X band saw back in 2009, I discovered how valuable these tools really are to anyone cutting metal, but they cut with such ease. Because the blade is moving in one direction and pushes your material into a small table, the band saw has very little vibration, and unlike cutoff wheels, they throw almost no sparks. 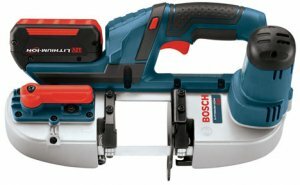 Bosch has recently introduced a compact portable cordless band saw to their 18-Volt line up which should make a lot of people happy. There are other cordless models on the market today, but each one is different. What I like about the Bosch BSH180 Band Saw is that it is one of the smaller cordless units on the market, similar in size to the Stout-X, and has a similar 2-1/2" cutting capacity. What really impresses me about the Bosch BSH180 is it's claimed 150 cuts per charge in 1" conduit. That, coupled with two batteries, should make the Band Saw a great portable metal cutting solution. The BSH180-01 is retailing for around $400 and includes two of the Bosch FatPack batteries, 30-minute charger,and carrying case. A tool-only option is also available for Bosch battery owners for around $200.